Teresa St. Clair receives an award from a representative of Crime Victim Services. 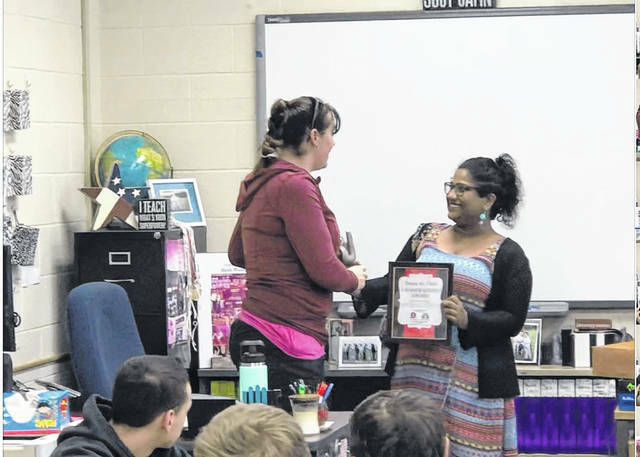 LIMA — Bath Middle School physical education teacher Teresa St. Clair was awarded the Change Agent Award from Crime Victim Services on Wednesday. The award is designed to recognize and reward outstanding leadership, primarily focused on the commitment to violence prevention. https://www.limaohio.com/wp-content/uploads/sites/54/2019/04/web1_teresa-st-clair-orig.jpgTeresa St. Clair receives an award from a representative of Crime Victim Services.